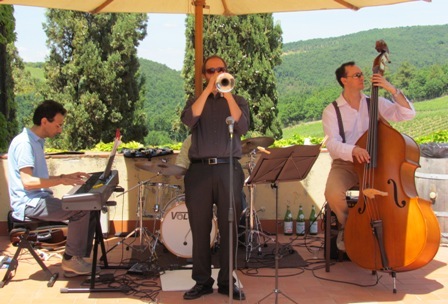 Yesterday, before meeting up with our friends, one of whom was playing all day with his jazz band at a winery (see previous post), Stefano and I stopped at Montefioralle, a 12th century fortified hilltop village not too far from Greve in Chianti (=less than an hour’s drive from where we live in Florence). 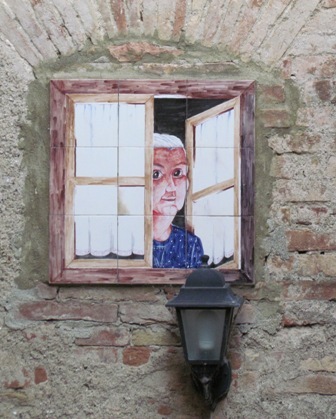 Finocchiona supposedly owes its origins to a thief at a fair near the town of Prato, who stole a fresh salami and hid it in a stand of wild fennel. When he returned for it he discovered it had absorbed the aromas of its hiding place and had become fit for the Gods. 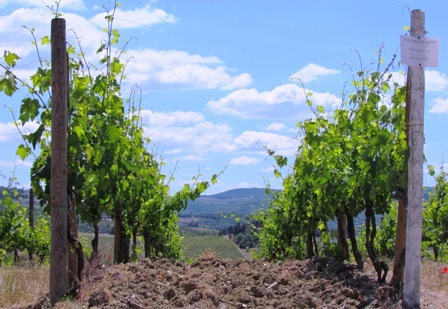 Anyway, if you are in Italy on the last Sunday in May, don’t miss Cantine Aperte. It’s a GREAT experience, especially if your GPS misbehaves hehe…and a very tasteful one, too! 🙂 Oh, and I should note that many, perhaps most, of these wine-tasting events are free. Yes, free. Studies done recently by a group of Japanese researchers have also shown that the metabolising of curcumin could be influenced by the abundance of bacterial flora found in the colon […]. The researchers were also able to determin that Escherichia coli, an abundant layer of bacteria in the colon, possesses an enzyme capable of transforming curcumin into tetrahydrocurcumin, a more stable version of the original polyphenol. This is particularly interesting considering that secondary studies showed that the anti-inflammatory and anti-cancerous activity of tetrahydrocurcumin is even higher than that of curcumin itself. In other words, far from reducing its cancer-fighting potential, the transformation of curcumin by some intestinal bacteria could instead increase its power and therefore play a major role in the multiple health benefits associated with the regular consumption of turmeric. Busy days…But this morning I did find time to read a few Science Daily articles that I hope you will find interesting, too. Certaldo, like many other Tuscan hilltop towns, is divided into two parts: 1. the medieval walled town perched on top of a hill (= Certaldo Al ta, which literally means “high” Certaldo) and 2. the modern and, er, much less attractive town (= Certaldo Bassa, or “low” Certaldo) located at the bottom of the (same) hill. 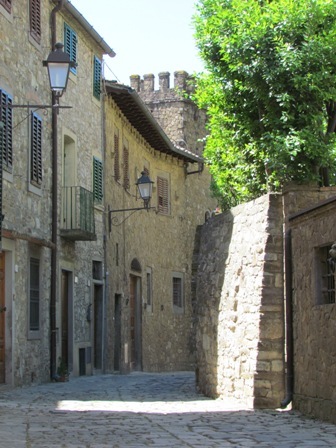 What we did was park in the modern part of Certaldo and reach the hilltop part by cablecar. Now that was fun! 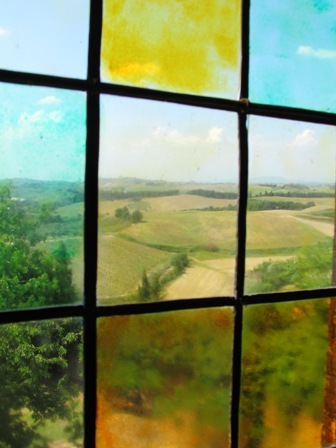 The 360° views from the Boccaccio family home’s brick tower are magnificent (see photo no. 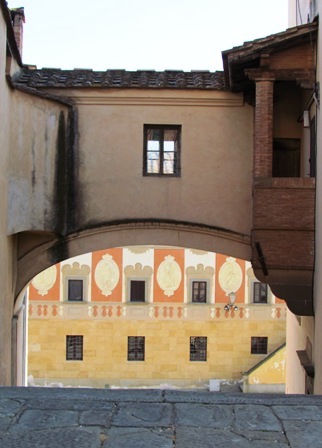 2, a view over the rooftops of Certaldo Alta). Stefano and I climbed up to the top terrace and were blown away by: 1. the views…goes without saying, and 2. the horrendous, overwhelming heat. 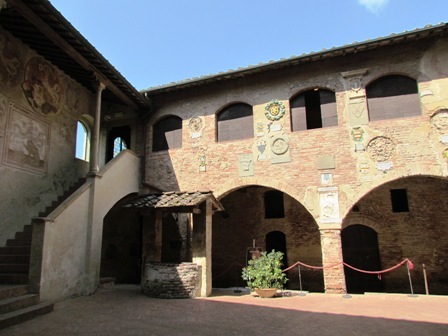 We also visited the Palazzo Pretorio or Palazzo Vicariale, a beautiful palace that used to be the residence of the governors of Florence and is located in the highest part of Certaldo. Unfortunately, its strikingly picturesque façade, decorated with a variety of ceramic coats of arms, is being restored right now, so I don’t have any photos of it. Almost the most enjoyable part about visiting the two towns of Certaldo and Casole d’Elsa yesterday was the complete lack of tourists. 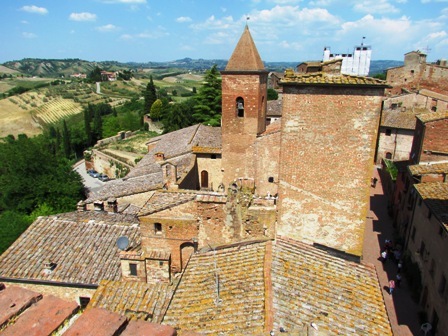 The much more famous town of San Gimignano is absolutely gorgeous, no question about that!, and I love to go there…However, at this time of year (well, at ANY time of year!) 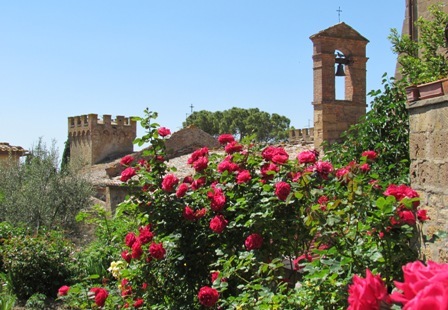 it is jam-packed with tourists, which is great for the economy but…well…you know!!! My point is: other, not-so-famous Tuscan hilltop towns may not be as stunning as San Gimignano, but part of their charm and appeal is that they are not as crowded, and the other thing is that you will most likely eat well for a reasonable amount of money (= we had a very nice lunch in Certaldo, in fact…). 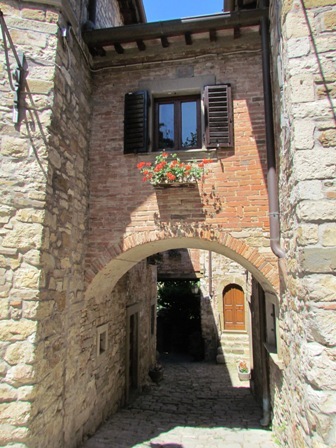 The town of Casole d’Elsa (my photos of Casole begin with the narrow, plant-filled street view, i.e., photo no. 5) is where we finally met up with our friends in the late afternoon. 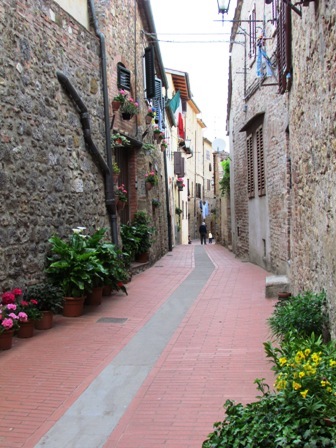 It wasn’t as pretty as Certaldo, for sure, but it was very lively and colorful, and we enjoyed our visit. 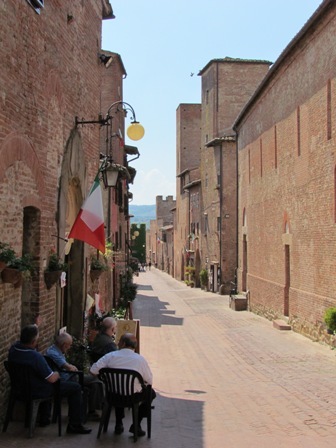 The town was bustling with preparations for an upcoming “palio,” which, like the more famous palio held in Siena, is mainly a horse race (of medieval origin). 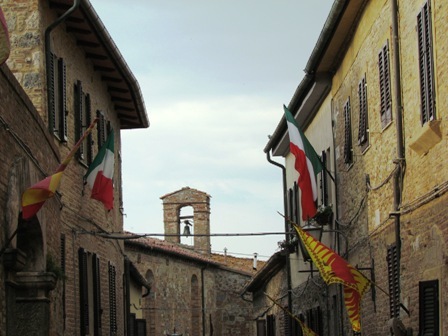 It was fun to walk down the streets of rival contrade, or town wards, and take photos of the differently colored contrade flags waving in the wind…Photo 6 shows two flags from the contrada “Pievalle,” in addition to two Italian flags (celebrating the 150th anniversary of Italy’s unification). I’m verrrrry pleased, of course. The more articles we have about curcumin (and other non-toxic extracts), the more the amazing healing properties of curcumin cannot be scoffed at and ignored. It’s about time…! Here are just a few examples of the recent stuff I’ve read. A Medical News Today article reports on a new University of Michigan study on head and neck cancer and curcumin. In a nutshell, the researchers were able to cut the dose of the chemotherapy drug cisplatin by four by using a new curcumin compound, FLLL32, which also reduced chemoresistance: http://goo.gl/EVvj2 (Oh, there is a slight mistake in the article: the Indian spice is “turmeric,” not “curcumin.”) Amazing, eh? I’ll stop here…So much to read, so little time! 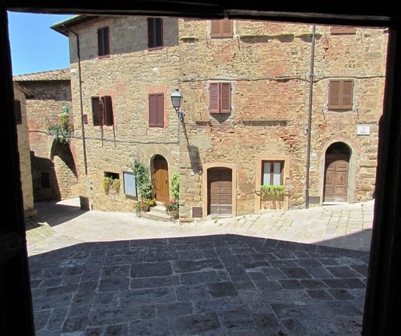 My UK blog reader and his family left Florence this morning and are probably back in London by now…Boy, the house seems so empty without them! We really had a glorious time and hope to meet up again soon. I haven’t had any time to do research today (ehm, I am desperately trying to catch up with my e-mails in my snippets of free time…), but I did manage to read an interesting Science Daily article on the healthful effects of tai chi & green tea on our BONES. You will be surprised, I think: http://goo.gl/gF5z1 Good stuff! Oh, speaking of which, a quick word of caution: please don’t forget that you should not drink green tea or take any supplements containing EGCG if you are taking Velcade. Or rather, you should avoid green tea/EGCG on your “Velcade day.” At a patient seminar, Dr. Brian Durie told me that it’s okay for green tea aficionados to have a cuppa on their “off-of-Velcade” days. This was one of the loveliest weekends that Stefano and I have ever had…Everything was perfect, simply purrrfect. 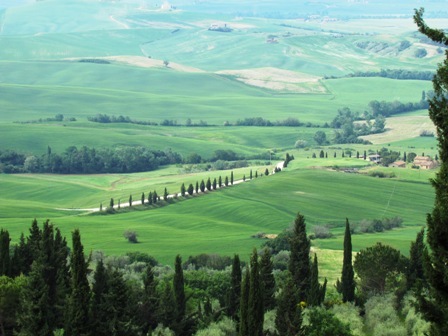 We’d both forgotten how stunning the Val d’Orcia is…the area around Pienza and Montepulciano…magnifica! Stefano and I had to return to Florence last night, but our British friends are still there, exploring other bits of the region located south of Siena. They are coming back to Florence this evening. 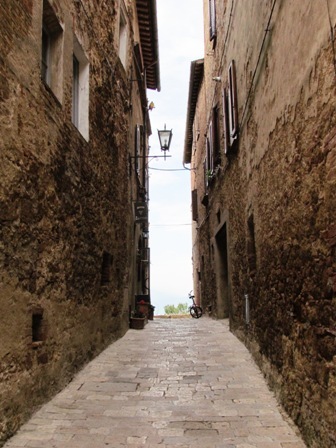 I really don’t have much to say about any of my photos, except to explain that I took the first two in the ancient village of Monticchiello, about halfway between Montepulciano and Pienza. 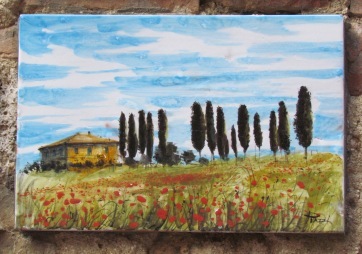 This particular one was taken very near the ancient, and beautiful!, town of Pienza. Photo no. 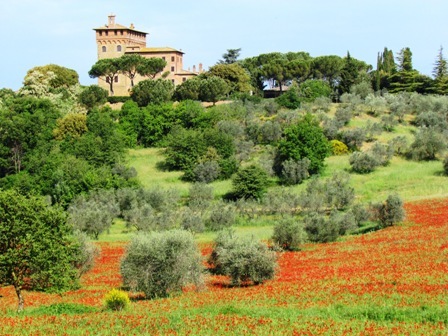 4: a view of Palazzo Massaini, near Pienza…Don’t you just love those poppies???!!! After admiring the Arno River from the Ponte Vecchio, we walked to and over the next bridge, Ponte alle Grazie, to get some good shots of Florence’s most famous bridge (see above). From there we visited the church of Santa Croce. AND, of course!, Piazza Santa Croce (=the square in front of the church), which is one of my favorite places on Earth! But I have written about Santa Croce before, so I’ll try not to repeat myself. 🙂 After a quick stop at Vivoli’s for some gelato (=ice cream), we headed back home…and collapsed! Here are a few random photos, chosen among the ones I took yesterday. As I mentioned, the first is a shot of the Ponte Vecchio taken from the Ponte alle Grazie. 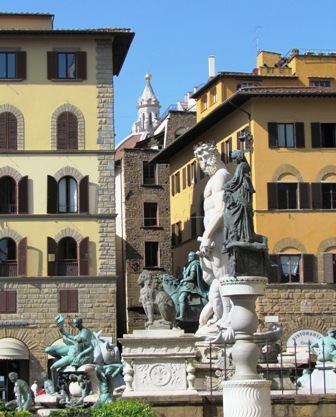 Then we have a side view of the Fountain of Neptune, located in Piazza della Signoria. If y ou look at it closely, you will catch a glimpse, in the distance, of the very top of the famous dome of the cathedral in Florence. 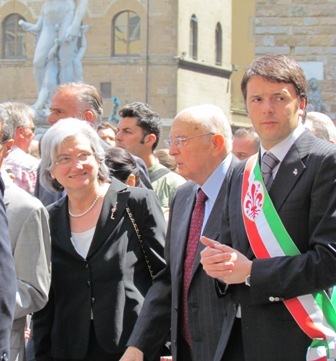 I asked a policeman what was going on…He told me that the President of the Italian Republic, Giorgio Napolitano, was inside the Palazzo Vecchio (= the town hall of Florence, among other things) and was about to come out. Wow! 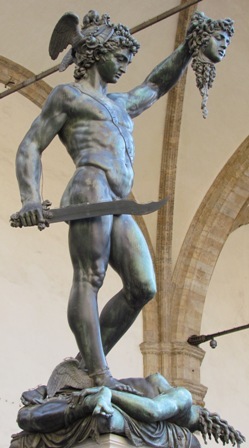 Photo number 4 shows Benvenuto Cellini’s Perseus, holding the severed head of Medusa…This is one of the many statues located inside the Loggia dei Lanzi, = a 14th century “arched” open building on a corner of the Piazza della Signoria. 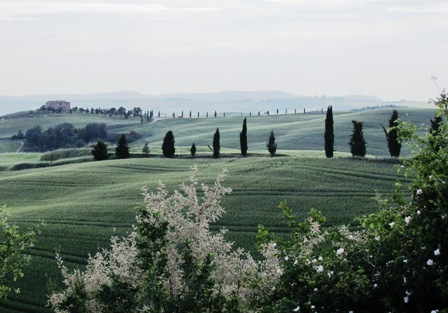 This morning, while Stefano and I went to work, our friends headed off to the stunning Val d’Orcia region, which is more or less south of the city of Siena. Stefano and I are going to join up with them tomorrow. 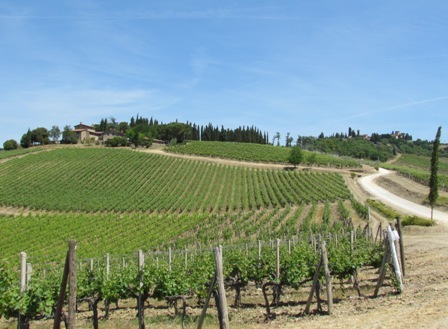 It should be great fun…I just hope that this glorious, not-too-hot weather holds up and that my photos of typical Tuscan landscapes, with rolling hills and cypresses and whatnot, will turn out well!! !